Dräger is a leading multinational company in the field of technology dedicated to the medical and safety sector. The company’s motto, “technology for life”, also translates into the range of equipment designed to increase road safety. 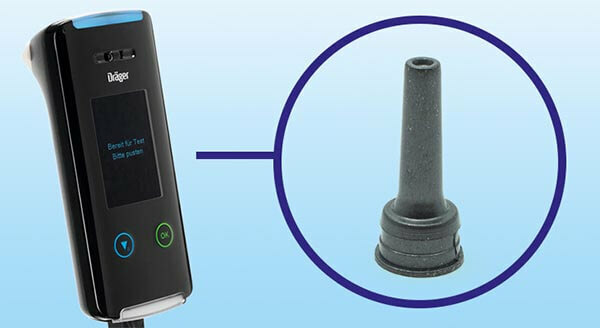 The family of Dräger drug and alcohol detection devices for roadside testing by law enforcement today also includes additional solutions designed to allow the driver to personally test his or her driving ability. Interlock 5000 and 7000 devices, which can be installed on any vehicle and equipped with GPS/GPRS communication modules, instantly detect the alcohol content in the breath exhaled by the driver, preventing the engine from being started in the case of positive test. These devices require, of course, maximum operating precision, so as to prevent the vehicle from being blocked or, worse, used due to wrong measurements. In addition, the electrochemical sensor of the breathalyser should be quickly ready for use and feature low power consumption of the electronics even at very low ambient temperatures. To achieve these results, Dräger successfully used LATI thermally conductive compounds of the LATICONTHER family based on 70% graphite reinforced PP and PA6. These technopolymers were chosen by Dräger engineers for the manufacture of the moulded mouthpiece and sensor heaters due to their combined high electrical and excellent thermal conductivity greater than 20 W/mK, so one hundred times that of conventional plastics. The injection moulding of these pieces is made possible by the rheological properties of the compounds, formulated so as to ensure the filling of complex cavities despite the presence of a high percentage of conductive charge. Mechanical strength and heat resistance typical of automotive applications (from -30° C to + 85° C) are additional properties of selected compounds. The special composition of PP-based LATICONTHER compounds also allows the use in contact with food and therefore with the driver’s mouth. The performance of LATI compounds also allowed to obtain for the breathalyzers of the Interlock family both the E1 mark and the EN 50436-2 certification, the European standard for the use of blocking devices based on alcohol concentration for preventive purposes. For any further information, contact LATI Spa technical service – www.lati.com.